Before I begin to explain what Galápagos is about, I have to tell you how the story is framed. At first the narrator seems to be third person, but as the story progresses, you realize that’s not the case. I’m not going to tell you who he or she is (it’s not a major spoiler, but it’s more interesting to find out as you read the book), but I will tell you that they are one million years in the future telling a story that mostly takes place in 1986. This is a messy plot summary, I know. Kurt Vonnegut’s books are difficult to summarize, but that doesn’t mean they’re confusing or hard to follow. His plots can be complex, but it’s not really about the plot anyway. I read him for his ideas, for his writing, for his wonderful and unique mix of humour and tenderness and sadness. This financial crisis, which could never happen today, was simply the latest in a series of murderous twentieth-century catastrophes which had originated entirely in human brains. From the violence people were doing to themselves and each other, and to all other living things, for that matter, a visitor from another planet might have assumed that the environment had gone haywire, and that the people were in such a frenzy because Nature was about to kill them all. But the planet a million years ago was as moist and nourishing as it is today – and unique, in that respect, in the entire Milky Way. All that had changed was people’s opinion of the place. Frighteningly familiar, isn’t it? I love the idea of humankind evolving to have smaller brains because our big ones cause more trouble than they’re worth. Or rather, I love the way Vonnegut writes about it, which is with humour and sorrow and hope. Our brains do cause a lot of trouble, and we can trace things like war, violence and a myriad of sophisticated and cruel ways to hurt others to our big-brain ideas. And history is full of situation that make me wish we only had mouths and flippers. So I have to say that human brains back then had become such copious and irresponsible generators of suggestions as to what might be done with life that they made acting for the benefit of future generations seem one of many arbitrary suggestions which might be played by narrow enthusiasts –like poker or polo or the bond market, or the writing of science-fiction novels. It made me go Yes! And then no. Because those possibilities, those arbitrary suggestions, include everything that I love. Not just food and babies and survival, but…what makes our lives what they are. Stories, inventions, curiosity. Everything. But of course, they also include all the terrible ideas our species has had, and we don’t even need to be reminded of how terrible some of them have been. This mix of sadness and awe, of hope and disappointment, permeates the whole book. And I love Vonnegut for it. 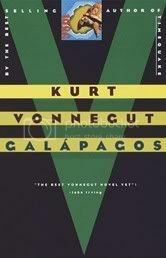 Galápagos is such a great book. It’s funny and bizarre and not bizarre at all, and really really touching at times. Once again, Kurt Vonnegut did not disappoint me. It pains me even now, even a million years later, to write about such human misbehaviour. A million years later, I feel like apologizing for the human race. That’s all I can say. In a sense, too, this man had already been hit by a meteorite: by the murder of his mother by his father. And his feeling that life was a meaningless nightmare, with nobody watching or caring what was going on, was actually quite familiar to me. That was how I felt after I shot a grandmother in Vietnam. She was as toothless and bent over as Mary Hepburn would be at the end of her life. I shot her because she had just killed my best friend and my worst enemy in my platoon with a single hand-grenade. This episode made me sorry to be alive, made me envy stones. I would rather have been a stone at the service of the Natural Order. But I have yet to see an octopus, or any sort of animal, for that matter, which wasn’t entirely content to pass its time on earth as a food gathered and to shun the experiments with unlimited greed and ambition performed by humankind. And then, as though in trances, the people would really do it – have slaves fight each other to the death in the Coliseum, or burn people alive in the public square for holding opinions which were locally unpopular, or build factories whose only purpose was to kill people in industrial quantities, or to blow up whole cities, or so on. I was getting ready to post this when I realized I would be posting a review of Galápagos on Darwin Day. How fitting. Charles Darwin was born two hundred years ago today. Happy Darwin Day, everyone! I remember, back all those many years ago when I went through my frenzy of Vonnegut reading, that this was one of my favorites. Though I would have been hard pressed today to give many details about it. I absolutely adore your review...and I sooooo want to go back and read this again now! I read Slaughterhouse 5 in high school but barely remember it. For some reason I get it mixed up with Fahrenheit 451, which I never read but saw a movie that creeped me out. I've since avoided Vonnegut, which makes no sense because he's not in the least bit connected with 451...I need to read something of his. I've never read Vonnegut and your review makes me feel as if I'm missing something special...I'm going to make sure that I give one of his books a try. Excellent post! Like Debi, it's been years since my Vonnegut frenzy. Great review. Huh! From the second paragraph, it sort sounds like what happened in Wall-E. This sounds very neat!!! Happy Darwin day to you too :D I haven't read anything other than Slaughterhouse Five by Vonnegut. This sounds like it might be my next one...The financial crisis...way too eerily similar! What a weird coincidence with his birthday and all. I've never read anything by Vonnegut. I think I should, just never gotten around to it. This sounds good! Nice review! I've been wanting to read another novel by Vonnegut (having already read Slaughterhouse and Cats Cradle), and I think you've made my decision for me. Thanks! ooh la la! this sounds very good! thank you for the mouth-watering review. you know, i've never read any vonnegut. first i thought i just had to read "slaughterhouse" and then someone told me about "sirens of titan" and now theres this! have to read some of his stuff! priscilla: Cat's Cradle was my first too. I enjoyed it, but it wasn't until Slaughterhouse-Five that I fell for him. Staci: He's quickly becoming one of my favourite authors. So yes, for me he's something special indeed! Lezlie, I couldn't agree more. Chris: It is almost eerie. I can't imagine you not enjoying this, so yes, read it next! Melody, thank you :) I hope you have a great day (and weekend). Michelle, I hope you enjoy him when you get to him. Biblioatrist: Those were the ones I started with too. I hope you enjoy this! JP: Oooh, you must read Vonnegut! He's so so good. I have this one waiting on my TBR along with others by Vonnegut. Thank-you for the review. I've been meaning to read Galapagos for years. Your enjoyable review has finally made me decide to do it. By the way, I notice that you are reading my novel Clan Ground. I hope you have fun with it. Olaf Stapledon is another author who does human evolution in the future. You might try Last and First Men, and Star-Maker. Also Odd John. Madeline, I hope you enjoy it! I really love Vonnegut. I read this for an independent assignment in high school and loved it. He may have been the only American author I read in high school that I actually enjoyed reading. I was able to see him speak when I was in college (actually got paid for it - he was speaking in the library during my shift) - he was a really amazing speaker. I have heard of this author but never read him before. You made the book sound very intriguing and makes me want to read it. I find myself branching out more on my reading choices with each and every review. Thank you. Megan: wow, that's great that you got to hear him speak! Robin: Blogging is great for that, isn't it? :) I keep discovering new things thanks to my fellow bloggers. Hi Nymeth, you do read the most interesting kind of books! I have not yet read Vonnegut, but you just sold me! I think this may be my first! I have a new found love for Vonnegut! I had not put this one in contending for my list of his to read but now I def think that I will have to! Looking for Alaska (or better...Alaska!) has made me want to read Kurt Vonnegut although he wasn't in my list of priorities before. This sounds great, and really thought provoking! Galapagos sounds like such a great read! I've read 3 books by Vonnegut, all of which I enjoyed. Next up I will be reading his autobiographical book Palm Sunday. But I'm going to keep my eye open for this one too. Alice: Some would say I have no focus :P But I like variety! Mariel, it'd be a great starting point! Valentina: It is great! I was so happy when Alaska mentioned Cat's Cradle...that was my first Vonnegut. I saw your rating on librarything, btw :D Hooray! Joanna: I haven't real Palm Sunday yet, but I read his very last essay collection, A Man Without a Country, and it was awesome. His non-fiction is just as great as his fiction. I found this blog while gathering info to tutor an AP English student who is having struggles--and reading Vonnegut this spring. You have inspired me to get off my tush and read these books, not only for my own selfish pleasure, but to be a better tutor! I realize these posts I'm reading are three years old, so I hope you are checking your blog...and please know you have been a help to me.